This week’s post comes to you from Malaysia, where we highlight a company that holds the title of this country’s biggest Transit TV network. Asia Media is the most advanced Transit DOOH network I have seen during this tour of duty in Asia. 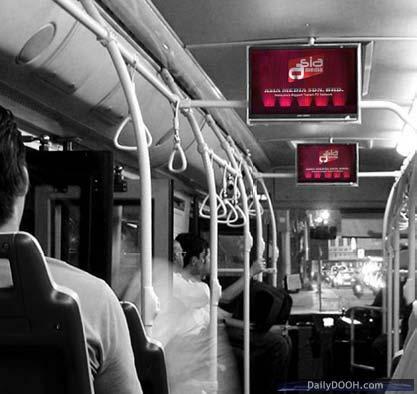 It is an impressive network of over 3000 screens that are strategically installed on 1500 buses- which just happen to have the most enviable viewership of over 500,000 commuters daily. I had the honor of talking with Ricky Wong, Asia Media’s CEO and founder. He was kind enough to share with me the “secrets” of Asia Media’s successes. His company employs a truly innovative engagement strategy that combines social media with a well engineered customer journey. Asia Media participates in two way conversations that occur within the context of social media and then creates its programming based on what the viewers really care about. But don’t just take my word for it, Ricky’s got some amazing case studies and market research to prove it. Asia Media’s programming is continually refined and places a high value on involving the viewer at the center of the each experience. A typical digital campaign includes interaction via mobile phones, on-line participation, viral videos, games, polls and sweepstakes. All the ingredients needed to keep a viewer occupied during the long commute times. What’s next for Asia Media? – Toward the end of 2009, Asia Media made a sizable investment to upgrade the capabilities of the existing transit network with the deployment of DVB-T technology which will allow for the playback of live HD quality broadcasts as part of the overall content loop. If you’re interested in learning more about Asia Media, you can find them by clicking on these links for Twitter or Facebook. This entry was posted on Wednesday, April 21st, 2010 at 17:33 @773 and is filed under DailyDOOH Update. You can follow any responses to this entry through the RSS 2.0 feed. You can leave a response, or trackback from your own site.